Program: 9:00 a.m. - 4:10 p.m. In addition, get the must-have Virginia Lawyers Practice Handbook Elder Law in Virginia (2017 edition) included in the regular seminar registration fee at a deep discount. Elder law practice might entail more than you think: The attorney plays a leading role in the resolution of a myriad of interwoven problems that elderly clients face, only one or a few of which may be legal problems. As your clients get older, you can expect to encounter legal issues in any number of different practice areas, including Medicaid eligibility planning, estate planning, conservatorships/guardianships, removal of fiduciaries, nursing home litigation, drafting or correction of deeds, premarital agreements, taxation, insurance policy matters, etc. In dealing with these legal issues, an elder law practitioner also needs to understand, among other things, the aging process, family dynamics, and the resources that are available to the elderly. This program is geared to practitioners who want to expand or refresh their knowledge of the fast-growing field of advising the elderly. E-mail distance_ed@vacle.org to be notified when/if this program is made available as an online or USB seminar. E-mail publications@vacle.org to be notified when/if this program's seminar materials are made available for sale. 10:25 Planning for Incapacity — How Much Is Enough? Special Needs Trusts permit beneficiaries to maintain eligibility for needs-based government benefits, such as Medicaid and Supplemental Security Income (SSI), and permit beneficiaries to use the trust funds for goods and services not paid for by these programs. Beneficiaries may be children or adults with disabilities or, in certain circumstances, elderly persons. Our chosen speakers are two of the brightest stars in the elder law field in Virginia. Both concentrate on providing extensive services for the elderly in the areas of estate planning, estate administration, guardianships, fiduciary representation, asset-protection planning, and planning for special needs. Both are in high demand as lecturers on elder law and special needs planning. As an attorney and a Certified Public Accountant, Tim Palmer has the academic background to address the most complicated legal and tax issues affecting the elderly. Carolyn White is a director in the Elder Law section at ThompsonMcMullan, P.C. ; prior to merging the firms, she was a partner at White & McCarthy, LLP, from 2001 to 2018. Since she began practice in 1993, her practice has focused on estate planning, probate, trust administration, long-term care planning, and elder law. VIDEO REGISTRATION FEES (Lunch not included). $290 regular registration (includes Elder Law in Virginia (2017 ed., including electronic forms)). $215 I already own the 2017 edition and will bring it to the seminar. $275 preregistering VAELA member (includes Elder Law in Virginia (2017 ed., including electronic forms)). $200 preregistering VAELA member: I already own the 2017 edition and will bring it to the seminar. $305 on-site registration (if space is available) (includes Elder Law in Virginia (2017 ed., including electronic forms)). Click here if you wish to register three or more people from the same firm. 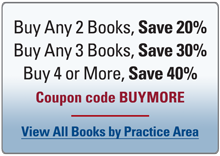 A special 15% discount and free shipping on Virginia CLE®–published books will be available for purchases made at the seminar site. Cancellation/transfer requests will be honored through 5:00 p.m. of the DAY BEFORE the seminar. Inclement Weather Policy and Updates. If you have a disability that requires special accommodation, please contact Virginia CLE® well in advance of the program date. Private recording of this program is prohibited.